Guns N’ Roses. The band name conjures up images of many of the stereotypes of bad boy rock and roll. Some of those images might be deserved. I don’t know. I’ve never been around when any of the reported bad stuff supposedly happened. I know that, a) I’ve seen the band twice in a one year period and they’re consummate performers and professionals; and, b) I’ve now interviewed two members of the band and they’ve both been incredible to chat with. My first interview was in November of last year with band keyboardist, Dizzy Reed, via an amazingly clear phone connection to his hotel room in Paraguay. 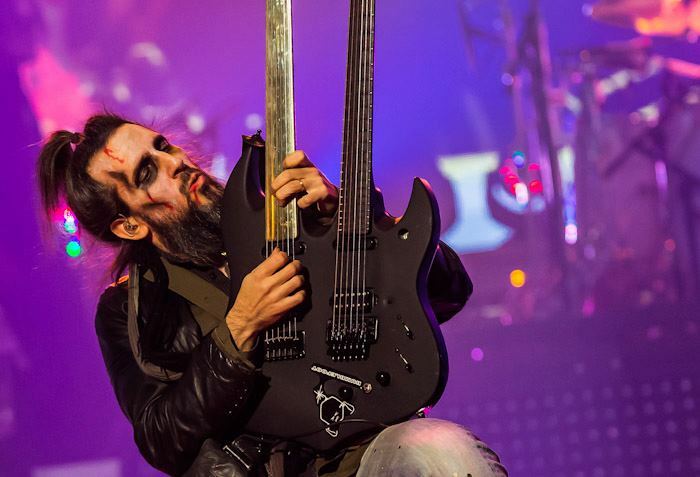 The second interview was recently – again by phone – with one of the band’s three guitarist, Ron “Bumblefoot” Thal. Okay. 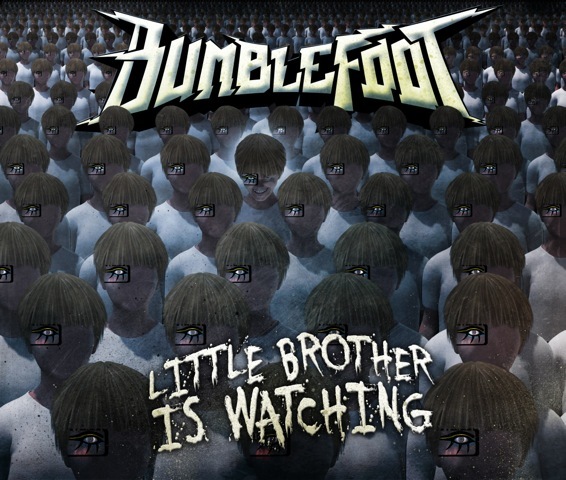 I’ll stop right here and, for you uninitiated and unwashed readers, I’ll answer the question that is bouncing around your mind: What is a “bumblefoot” and why is Mr. Thal called that? 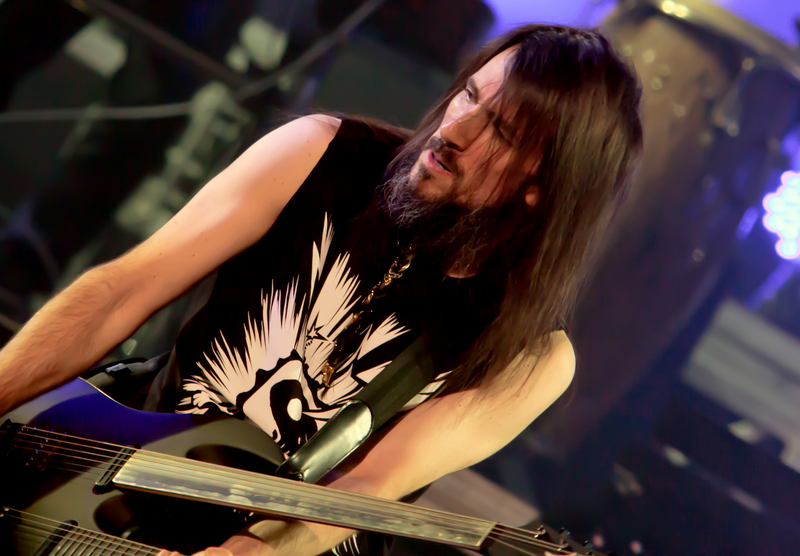 Bumblefoot was the name of Ron Thal’s first album, The Adventures of Bumblefoot which he came up with while helping his then-girlfriend study for veterinary school. Click here for why she might have been studying that term. Now, back to my chat with Mr. Thal. 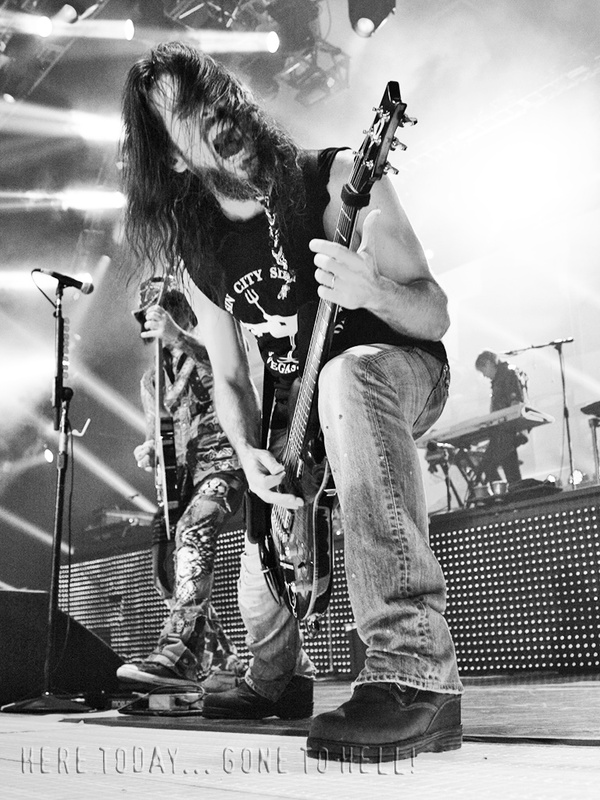 An unexpected – but pleasant – surprise came in the form of Bumblefoot explaining how he and his wife met. When Ron learned that I grew up in Phoenix, his voice lit up even more. “Oh, man! I love Phoenix! You know that Musical Instrument Museum that they just opened up a few years ago? Man! It is incredible! You can spend the whole day there! You put on a set of headphones and they have all these displays of every single type of instrument from every period in time. It’ll have African tribal instruments and ones that they use for rituals and for certain ceremonies and ones that they use for all different things. It’s just incredible! They had one of John Lennon’s pianos there. They had all kinds of stuff there. You could easily spend an whole day in there.” We continued to talk about different things about Arizona and Texas – almost like two old school mates catching up on news about the old homestead. After we settled into our chat, I asked him what he was doing on his valuable time off besides talking to boneheaded interviewers like me. Since one doesn’t usually associate acoustic guitar work with Bumblefoot, I asked him if it was a challenge for him to work on that kind of music. After such a monster storm-trooper of a GNR tour, I wondered if it was hard for Thal to come down from it or is he just SO ready to be home that he doesn’t know what to do first. “The hardest part of starting a tour or ending a tour is the transition from being home to being on the road. You get off tour. You don’t have a day sheet slipped under your door. You don’t know what to do with your time. You don’t know what to do with all this freedom to do anything because, when you’re on tour, you’re kind of limited as to what you can do. But, when you’re home, for me, I can do anything. Because of that, I just don’t know what to do with myself. There’s been time when, as soon as I got home – before even unpacking, I just started tearing up the ceiling and putting in recessed lighting for three days. This time, I immediately went right into the studio and started blasting out stuff. If find that that’s the best thing to do is just right back into some kind of work that you would normally be doing at home and that gets you right back into it where you don’t have time to get all weird about the transition. As for how Mrs. Thal handles him during those times, he said, “She’s been watching me do this for so long, she gets it. She comes on tour a lot, too, and she knows how weird it is to get off the road and come back home. She’s experienced the transition, as well. For me, I could be gone for three months and for her, she could come out for a couple of weeks or a couple of days and then go home and then do it again. She’ll pick and choose where she wants to go. Like, ‘Ah! I’ve never been to India! Let’s go to India!’ And we work it out. When I comment that many people may find that description of life on the road with Guns N’ Roses as quite different from the image of trashing hotel rooms and such, Thal said, “There’s a lot of everything. There’s trashed hotel rooms, sometimes, but it’s usually for a good reason! Ha! Ha! One time, they were testing the smoke alarms every morning starting at eight in the morning and sometimes going on until one in the afternoon. Picture three mornings of that when you’re working at night. Finally, by the third morning, one of our guys went out and found the guy in the hallway testing everything and pretty much told him that he was going to kill him if he makes one more sound. He was so mad that he just kicked around some things in his room. Then next three GNR specific questions I asked Bumblefoot were the same three that I asked Dizzy Reed. I started off by saying that, from the outside looking in, people view GNR as a rolling thunderstorm of chaos, confusion and confrontation. What does it look like to him from his vantage point? What does Thal think is the most misrepresented, misunderstood or most unknown “thing” about GNR is? “That we are not wrestling characters that are good guys and bad guys when it comes to the past and the present versions or different members of the different chapters of the story of Guns N’ Roses. People are surprised to know that Izzy (Stradlin) came out and jammed on a couple of songs with us for some of these shows. And Duff (McKagan) did. Things like that. It’s not all this past versus present, one versus the other. It’s all part of the same story. Guns N’ Roses is like this big book filled with so many chapters that are so unique and a story within themselves but they’re all part of the same book, part of the same history. It’s all part of the same life span of the twenty-five year life of the band. It’s a continuing story. the same creature. It just goes through changes. It started off as one thing but slowly morphed into another. That just happens – whether people die or quit, technology change, music styles change, or whatever happens. “It’s the same band but you have to look at it like one is the child, one is the adult, one is the gray haired wise dude. It’s the same life and the child isn’t the same person that he is when he is going to be fifty. But it’s the same life and the sum of the same experiences in the end. People say, ‘Well, it’s not the same band.’ You’re right, it’s not the same band. Different people. Different sound. Different world. Different century. Different everything. But it’s part of the same story and if you want to not acknowledge any aspect of that story, you’re just missing out on a lot of it you might enjoy if you let yourself. On a slightly different note, I asked Thal what he thought is the most misrepresented, misunderstood or most unknown “thing” about Axl? I couldn’t resist asking Ron if Guns N’ Roses are going to be touring again in 2013. Bringing the conversation back around to what’s on his plate right now, Mr. Thal said, “Most of the time, I’m looking at fonts. I’m a putting out my own line of hot sauces that’s going to be out next month. It’s something I’ve been wanting to do for years and I’m finally making it happen. The hardest part is designing the labels for the bottles, choosing between thousands of fonts for the right one to use for the name of this or the name of that. So, I’ve been spending most of my time designing the bottles for the hot sauces. In either Dallas or Austin – and right around NAMM – there’s a little chili or hot sauce festival and I’m seeing if I can find a way to jump out of NAMM just for the day to Texas for that. Bumblefoot has worked on a ton of different kinds of projects so I asked him what kinds of projects that he hasn’t worked on yet that is on his bucket list to do. “I find all these things just happen unexpectedly and unplanned. My paths cross with people that I didn’t think to meet and things like that just happen. I don’t know, it’s almost like I don’t really plan anything anymore. I just go the way the wind blows and just roll with whatever happens. Things tend to always happen. But let me think.” Then, once again with that joking lilt to his voice, he added, “Hmmm, gee, it sure would be nice to put out some music with Axl on some Guns music. That would be kinda nice.” Then, getting back into a more serious tone, said, “We’ve spoken a lot about it. It’s just a question of – I wouldn’t even say the planets aligning; That’s a little extreme as far as a metaphor – but I think we just need to have nothing else going on to where we can just focus on making new music and putting it out. There’s such strong people in the band. Dizzy is a great singer and songwriter. DJ – a great songwriter. Pitman is a great singer and songwriter. 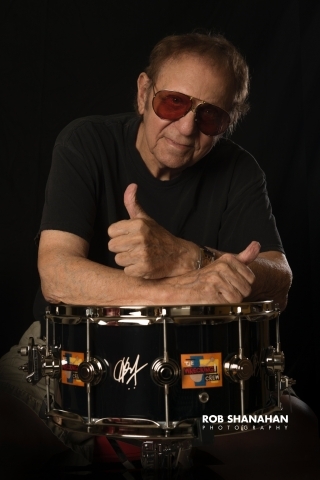 Frank is a great drummer. Tommy, he’s a great singer and songwriter. Richard, he’s a great player, songwriter. We have all the parts of the machine there. All we have to do is assemble that machine and hit the on switch. “We’ve been doing a lot of touring. It’s great and it’s made us tight and it’s made us solid. It’s made us to the point where we can jam and just sort of read each other’s minds and know where we’re going to go without having to look at each other. Now, I would love to put out music. It doesn’t even have to be an album. Let’s just put out songs. Put a song then hit the road and play that song. Then put out another song and hit the road and play that song, too. If we did that for each leg of the touring over the last few years, we would’ve had an album finished by now song by song. “That’s how I look at it: that, these days, putting out an album is too big of a bite to bite off. It’s not necessary. You can keep a constant simmer going by putting out a song and then a song and then a song, putting out music throughout the year rather than waiting two or three years and putting out fourteen songs at once. Albums are nice as far as having a piece of merch that you can hold in your hand but they’re no longer the source of the music. “Now, with the technology, you don’t just put out the song. What I did, I put out the song but I put it out in options of high res format, if you want .wav, if you want 320 MP3, FLAC, whatever you want. Here’s the instrumental version if you don’t want vocal. Here’s the recording stems if you want to do your own mix. I’ve had people do it where they want to keep the drums and bass and play their own guitar and vocals over it and stuck it on YouTube. I’ve done transcriptions with backing tracks. You can take each song and do more with it if you just focus on the song, I find. I’m always curious who commands an artist’s attention so I Ron who is on his radar these days. At one point in our chat, Thal shared his thoughts about what up and coming musicians should be doing as they’re building their careers. I knew that Ron was incredibly active in helping various charities so I asked him to tell me about some of what he’s been working on in that area of his life. “I get involved with a lot of different groups. When I was in Dubai, I visited the autism center there and they’re in need of a bigger building. The number of children every year that are affected by autism is growing so quickly and exponentially and is reaching the point that, now, one out of eighty kids have it. They’re thinking that by next year it will be one out of fifty-five. It’s not just children – it’s not just about teaching the kids how to be more functional – it’s about teaching families how to understand and help the kids. Everybody needs to learn and there are people who are experts and can teach that. There’s a school in Dubai where they’re doing great work there and having great success. I visited the school with a local band out there that I am friends with – a band called Point of View – we did a couple of acoustic songs for the kids and spoke with them there. 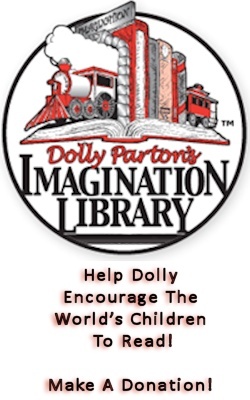 I’d love to do a fundraiser over there and help them get a bigger building to be able to accommodate the amount of families that really need to be there. That’s something I want to try and do. Concluding his thoughts on this, Thal mentioned how you can help him help others. In conducting my research on Bumblefoot, his biography on his website where he doesn’t mince any words about being the odd guy out while he was growing up and used that to fuel his creativity. No doubt that has contributed to his study of music and made him the kind of musician that he’s become. I asked him what kind of advice and encouragement he would give if he saw a pre-teen or teenaged Ron right now. “I would say don’t overthink because thinking too much is the enemy. We tend to start creating bloated scenarios that are based on our own fears and you can think yourself right out of something good in life. Don’t overthink. “Don’t care too much. It’s our natural tendency to care as much as we can but there is a limit. It’s like overeating – don’t over care. Care just enough to be positive and be productive and to be helpful but not to the point to where you feel that you’re crucifying yourself. “Keep your body healthy. No matter how much time you’re spending sitting down with your guitar, take a break and run around the room and keep your body healthy. That will keep your mind healthy. That will keep your world good. A healthy body is so important. You don’t realize it until it’s not there and, then, nothing else matters. So definitely stay healthy physically. “Stay in school! No matter how much you think you’re smarter than it, you’re not! Staying in school has nothing to do with education, it has to do with discipline. Stay in just so the discipline of doing something you don’t want to do and finding the good in it that you can benefit from. So definitely see it through no matter how much you don’t like it and uncomfortable you feel there and how out of place and how wrong it seems to be there. Whatever it is and whatever you’re telling yourself, stop telling yourself that crap and see it through. “I give myself the same thing that I tell everyone – three major things in getting ahead in life: Don’t be late! Be on time and being on time means being early; getting there fifteen minutes early, waiting five minutes and calling the person saying I’m ten minutes away and then walking five minutes later. Be on time which means be early and be ready. “Number two: Be over-prepared. For example: say you’re doing a session of some kind. You’re supposed to lay a guitar part. The bassist doesn’t show up. Well, guess what? You learned the bass part, too, you tell them, ‘Hey, I can lay down that bass part if you need. I learned it just to be safe. You’re going to be the most valued player in the room and they’re going to greatly appreciate that. Guitars. Do you mind if I ask how many you own? In your mind, is there a “holy grail” of guitars that you either own or would like to own? “I’m not sure. It’s not as many as I should own. It’s not that many. If there’s a guitar I like, that’ll be my guitar for, like, thirteen years. I’ll play it straight. I used to take my guitars and modify them and keep on playing them. I think, maybe at the most twenty and a majority of those are probably on the road in a guitar vault waiting to be shipped to Australia in March. I have the Vigier double neck and a backup of that. I have three single necks from them. I have my ’89 Les Paul which is a reissue of the ’59. I have my Swiss cheese guitar. I have a replica that Vigier made of my Swiss cheese guitar. I have all of the other weird guitars. I have my flying foot guitar. It’s probably twenty guitars or under. I still have pretty much every guitar that I’ve had since I was a kid. I don’t sell guitars or get rid of them. I just get them because I like them and want to keep them and want to have them. When you’ve stepped off the tour bus of life and onto the stage of that great gig in the sky, how do you want to be remembered and what do you hope your legacy is? Normally, I would end an interview piece with the quote to that question. However, I have to add that, at the end of our call, the battery on the phone I was using died suddenly and threw the phone line into a lengthy, inexplicable reboot process. Ron tried repeatedly to call me back in order to make sure that I got everything I needed for the interview. How cool is that? 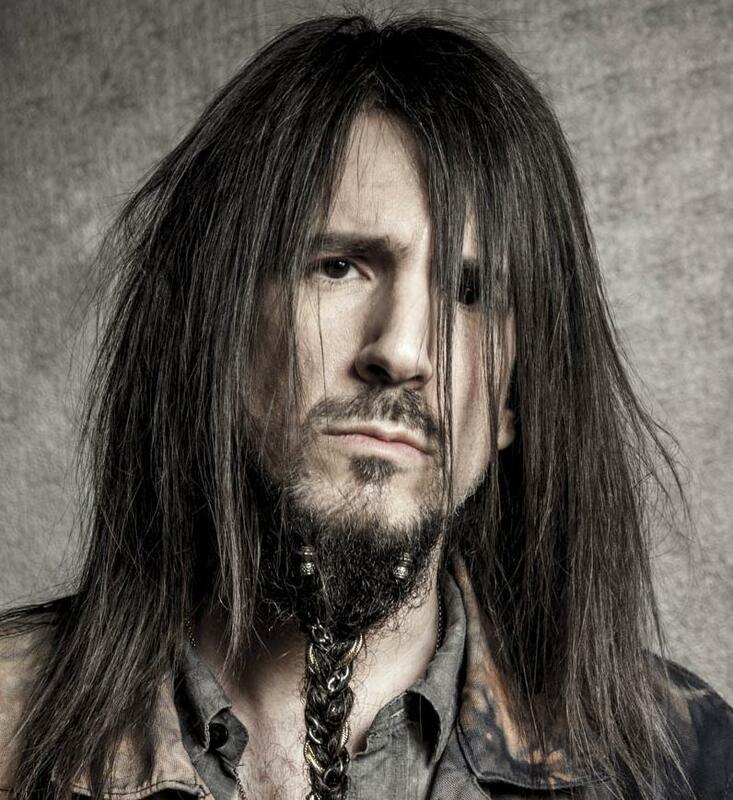 It shows that not only is Ron “Bumblefoot” Thal is an immensely talented and prolific guitarist, a highly intelligent conversationalist, but a class act who truly cares about others.